I had such high hopes for the Penn Project through the months it was under construction. 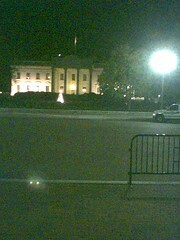 No way they’d be opening that stretch of Penn Ave in front of the White House to vehicular traffic ever again, right? So perhaps it would make sense to turn it into a sprawling pedestrian plaza — which is what I thought they were doing with the space. I passed by there on my way home today to check out the newly opened site, and was sorely disappointed. At first glance, hardly anything has changed. I had expected that the whole stretch of Penn Ave from 15th to 17th NW would be paved over with colored granite slabs, turning the street fronting the White House into an extension of Lafayette Park. 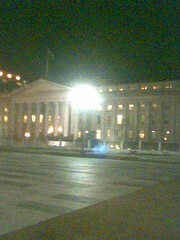 Instead, the granite slabs are just for the fronts of the Old Executive Office Building and the Department of the Treasury. The rest of the street remains mostly the same, with only minor cosmetic changes, some extra trees, and removed bollards. Ah, well. My fault for getting my hopes up and not looking at the Penn Project page earlier, where I would have seen the whole plan from the start. 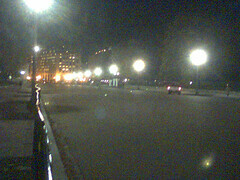 My own misplaced expectations aside, it’s nice to have that open space in front of the White House back, now tree-lined and bollard-free. And the newly asphalted surface should make for some excellent inline skating. More on DCist. Update: And yet more, plus link-back, from DCist.